Carl H. "Kappy" Scott was born in the village of Transfer, western Pennsylvania, and was one of the best pitchers ever to come out of the Shenango Valley area. A left-hander, Scott dropped out of school three days into his freshman year to join a section gang on the Erie Railroad. He first started playing baseball at the age of 14 with the Transfer Juniors and by the age of 21 (1933) he was the star pitcher with the Oakhursts team of Greenville, Pennsylvania. The Oakhursts, who also featured Kappy's brother Walter and cousin Earl Scott, were Mercer County champions in 1933, and four of their regulars, including Scott, tried out for minor league teams the following spring. Shortstop Joe "Bud" Uhle and Scott were signed by the Zanesville Greys of the Middle Atlantic League in May 1934, and sent to the Monessen Indians of the newly-formed Class D Penn State Association. As a teammate of future Yankees star Tommy Henrich, Scott made 10 appearances for the Indians and was 3-4 with a 6.86 ERA, leaving the team after the first half of the season. Scott returned to the Oakhursts in July 1934, and remained with the team through 1935. In 1936, he tried out with the Akron Yankees of the Class C Middle Atlantic League, but failed to make the grade and caught on with the Canton Terriers, a new entry in the same circuit. However, after appealing for pitching help to the parent Boston Red Sox in May, the Terriers received two experienced pitchers from the Class B Piedmont League and Scott was released. He remained in Ohio, joining the semi-pro Lansingville club of Youngstown's Slovak League, and on May 31, 1936, he hurled a 2-0 no-hitter for Lansingville against Holy Name, striking out 16. Later in the year he was back in Pennsylvania pitching for the Franklin Steelers of the Venango County League. When Scott was inducted by the Army on December 31, 1943, he was 31 years old. He served with the 330th Infantry Regiment of the 83rd "Thunderbolt" Infantry Division, and arrived in Europe on July 8. The division struggled forward through Normandy against strong resistance until it reached the outskirts of Saint-Lo on July 25. 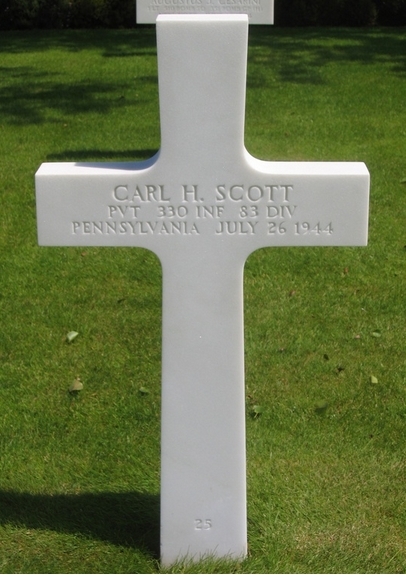 The following day, Private Carl Scott was killed in action in the vicinity of Marchesieux. He was buried at the Normandy American Cemetery in Colleville-sur-Mer, France, and survived by his widow, Dora. 1. Uhle batted .281 in 49 games for Monessen in 1934 and played in the minors the next two seasons.